Saturday afternoon June 18, 2010 (eight travelogue of this trip). 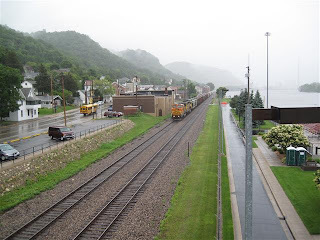 Monday (6/14) we took a northern tour on the Great River Road. 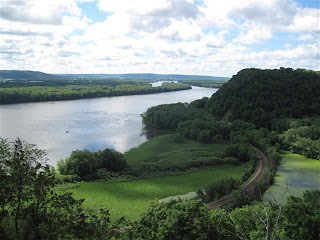 We drove up the Minnesota side from the I-90 exit to Wabasha, MN and then crossed the river and came down the Wisconsin side. That whole valley is so beautiful! 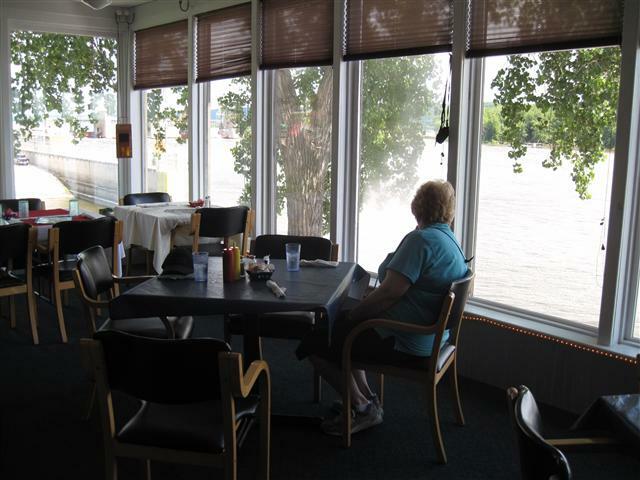 We stopped in Winona, MN for lunch in a great bar/cafe right on the Mississippi. They are famous for their grilled cheese sandwiches. Pat ordered the grilled cheese and I ordered a barbecue sandwich. We split the sandwiches and they were great. Our next stop was Alma, WI. That is a site of one of many dams/locks along the route. Most of the dams are very shallow and are probably used for flood control. The locks have an elevation change of less that 10 feet from the looks of it. When we got to Alma, we saw a tugboat and 6 barges approaching the locks. It was taking some time, so we decided to look around Alma (very small town) for a coffee house. Well, not only did we find one, but it looked like it was straight out of the ’30s or ’40s. 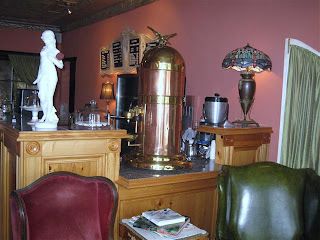 As you can see in the picture, they use a very old espresso machine. Not only that, they had great pie for Pat and I had a great scone. 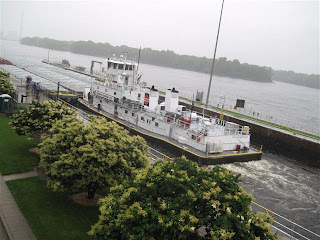 By the time we got done, the tug and barges were in the lock. I have attached a picture of them leaving. I have also attached a photo of the main street of Alma. It is very typical of the small towns all along the river. Almost all of this tour (a bit less than 200 miles) was in drizzling rain. Sounds terrible, but it really made for some neat scenery. Tuesday, we just took it easy and I started a fairly major project on the bus (more in the next travelogue). 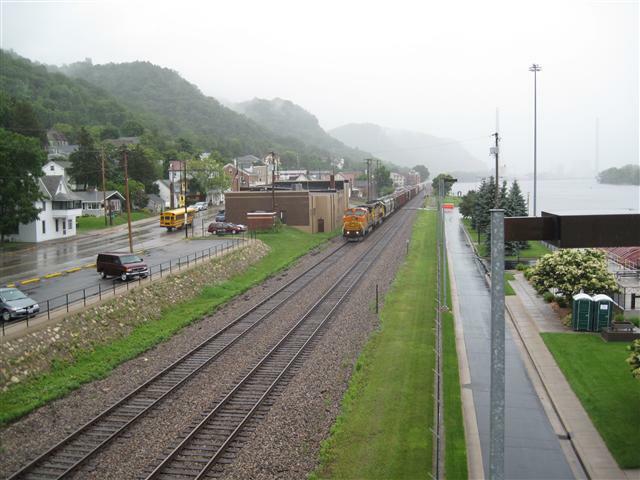 Wednesday, we took the southern route from I-90 to Dubuque and back. This was a bit over 200 miles round trip. We took the MN/IA side down and the Wisconsin side back. As was the case with our tour on Monday, the scenery was beautiful! The weather was bright and sunny, giving us a contrast to Monday. One of our stops was at the Effigy Mounds National Monument in IA. The history of these mounds is not well documented, but it appears that the Indians created them as burial grounds. Some of the mounds are huge in breath and width. Some are shaped like the profile of an animal. We took a fairly steep hike in the woods (about two miles round trip) to get to the Eagle Rock overlook. It was much more picturesque that the photo shows. We then drove to Guttenberg, IA where we had lunch right on the Mississippi. The first half of our return trip was a bit disappointing as we did not see the river. However, we did go thought some very neat little towns. On the last half to the leg, we were right on the river and it was again very picturesque. With all of the pictures we are posting, we will cut this travelogue short and pick up with more details in the next one. This entry was posted in Uncategorized and tagged Great River Road, Wisconsin. Bookmark the permalink.